The 62 metre motor yacht Bistango is sold with Michael Mahan and David Westwood at Worth Avenue Yachts teaming up with Jamie MacGregor at Macgregor Yachts to complete the deal. 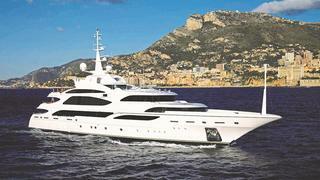 Built in steel and aluminium by Italian yard Benetti to a design by Stefano Natucci, _Bistango _was delivered in 2010. ABS classed and MCA compliant, her interior was designed by Studio Massari to accommodate 12 guests in six cabins consisting of a master suite, VIP suite, three doubles and a twin, all with en suite bathroom facilities. Features on this yacht for sale include a four deck elevator, a Turkish bath, a large tender garage which doubles as a beach club and a heli pad. Timeless styling, beautiful furnishings and sumptuous seating featured throughout her living areas create an elegant and comfortable atmosphere. Bistango's impressive leisure and entertainment facilities make her ideal for socializing and entertaining with family and friends. Twin 12V 4000 M60 MTU engines give her a cruising speed of 14 knots and a range of 6,500 nautical miles at 12 knots. Committed to a refit at the Lusben Yard in Livorno, Italy, her work will be completed on July 1st and she will then be available for charter in the western Mediterranean.